A few weeks ago, three weeks ago as a matter of act, I was sitting in a restaurant at the airport having a little brunch of scrambled eggs, toast, bacon, and fried potatoes before jetting off to Savannah for a long weekend. Cricket-chirp, cricket-chirp, cricket-chirp... I got a call on my iPhone from a number I didn't recognize. I swiped to answer and listened to an automated message about my flight to Atlanta being delayed for 30 minutes. I did a quick time calculation in my head and determined I would still have time to make my connecting flight to Savannah. I continued eating my brunch and the waitress refilled my glass of iced tea. I watched the television monitors, reading the closed caption news. Cricket-chirp, cricket-chirp, cricket-chirp... I got another call on my iPhone. I swiped to answer and listened to an automated message about my flight being delayed for another 30 minutes. I did another quick time calculation and decided I would have to move quickly to make my connecting flight to Savannah but as long as the gates of arrival and departure were pretty close, I'd be okay. I paid for brunch and headed to my departure gate, where I found one of the last seats in the waiting area. I sat down to wait. Cricket-chirp, cricket-chirp, cricket-chirp... I got a call on my iPhone. I swiped to answer and listened to the inevitable automated message about my flight being delayed another 30 minutes. I did another quick time calculation and realized my flight would now arrive in Atlanta about three minutes after my flight to Savannah took off. I checked in with the gate agent to determine my options. Yes, she confirmed I'd likely miss my connecting flight, but I would be on stand-by for the next flight and confirmed on the flight after that, in case there was no room for me on the next flight. Fast forward to Atlanta. The plane I was on touched down and was taxiing to the terminal just as my connecting flight pulled away from the gate. I got off the plane and proceeded to ride the train to the next concourse to check on my stand-by flight. I was eighth on the list for a stand-by seat. "Should I just go on to the next concourse for my confirmed flight", I asked the gate agent. "No, just stay right here." I dutifully stayed right there and watched as the passengers boarded the flight. I checked the monitor overhead and saw I had moved from eighth to fifth on the stand-by list. Ahead of me were four passengers who wanted to fly together, who were willing to wait for the next flight. My chances seemed pretty good. Finally, the gate agent said she could get us all on the flight. I grabbed my bag and rushed up to the gate to get my new seat ticket. I was delighted to be in seat 5A. Once on the plane, I found myself seated next to a woman who smiled and did not seem all that bothered that she had to get up to let me get to my seat. We began to engage in the usual polite chatter of two strangers sitting beside each other on a plane going to the same city. She was going to her vacation home. I was going to meet up with friends to see gardens. Gardens. The universal ice-breaker. The gateway to a multitude of topics. Doesn't everyone know something about gardens or gardening even if they don't garden? 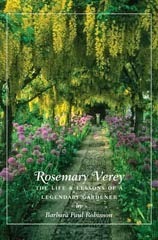 She had a friend who wrote a book about the legendary English gardener, Rosemary Verey. Did I know about it? She showed me the book on Amazon on her iPad. I did not know about it. I made a mental note to look up the book as soon as I got home. Fortunately, I remembered this mental note. The day I returned home, I looked up the book - Rosemary Verey: The Life and Lessons of a Legendary Gardener by Barbara Paul Robinson (David R. Godine, 2012) - and bought it. After all, if fate puts you on another flight next to someone who has a friend who wrote a gardening book, isn't it because you should read that book? I'm nearly finished reading it. It's fascinating. British, biography, and bits of gardening, all rolled into one book. Halfway thru reading it, I checked my own library of gardening books. Surely I should have a least one book by Rosemary Verey, who wrote 18 books. Yes, I have The Art of Planting. I'll read that next. Then I'll look for good used copies of a couple of other books by Verey. I suspect this is going to be the summer of reading books by Rosemary Verey, unless another rabbit hole opens up. Queue up some music by Elton John. Carol, this was a delightful journey with you, even through the frustrations of delayed flights, etc. Thanks for keeping all of us gardeners engaged and entertained! I think, the delays were meant to be. Rosemary's book, The Garden in Winter, was transformative for me. I've visited her garden at Barnsley House and many others she influenced. Though she is terribly out of fashion and somewhat treated with disdain by the home folk for her popularity among Americans, she will always hold a special place in my heart. We're so glad you did eventually arrive in Savannah! I'm going to look for that book. What a travel story! I hope you had a good book to read while you were waiting. I have never read a Rosemary Verey but this is just the nudge I needed. I just read a beautiful little book,Chasing the Rose: An adventure in the Venetian Countryside by Andrea di Robilant. Roses, history, touring gardens - heaven. So glad you found out about Rosemary Very's book, loved the story behind it. I have read about half her books and she has some great ideas which still hold good today. We visited her garden a long time ago and thoroughly enjoyed it. Love your story and the Verey books were meant to be. I've been to Barnsley House as well - what a treat that was (although the amount of work to maintain it, eek). Victoria lives near there now, btw.